The Kraken sleepeth … . (Leach 1984, 589; Levy 1999, 18–23). Despite the identification of the Kraken as the giant squid, however, there remains much to investigate—both about the maximum size of the actual creature and the accuracy of some accounts that may be greatly exaggerated or even outright fictional. My interest in the legendary Kraken was renewed on a trip to the Canadian province of Newfoundland and Labrador in 2008, courtesy of the Monster Quest TV series to investigate Lake Crescent’s purported “giant eel.” (It proved to be, most likely, otters swimming in a line [Nickell 2009].) In the course of my further travels in the province, I learned of giant squid along the Newfoundland coast. I was subsequently one of the “stars” (cast) of the “Kraken” episode of Animal Planet’s popular Lost Tapes TV series in 2010. Historically—following specimens that were sighted or stranded at Denmark in 1545, Iceland in 1639, and Ireland in 1673—the first in North American waters was reported at Newfoundland’s Grand Banks in 1785 (Ellis 1994, 125, 126, 130; Ellis 1998, 257). Other reports eventually followed. In October 1873, two fishermen and a boy in a rowboat in Conception Bay, Newfoundland, came upon a dormant floating object. Suddenly, a terrible creature came to life and fastened one tentacle to the boat while another encircled it and pulled so that water began to pour inside. Twelve-year-old Tom Piccott had the presence of mind to grab up a “tomahawk” from the bottom of the boat and chop at the estimated thirty-five foot tentacle. When he had hacked it off, he did the same with the other attached to the little boat, and the creature retreated into the ocean while emitting an inky fluid to obscure its trail. Harvey’s interest and expertise led him to further luck. Just three weeks later he was called to Logy Bay where an almost complete specimen had been brought, entangled in some fishermen’s net. As they tried to drag the net to shore, tentacles extending through it tried to grasp the boat, whereupon one man drew his splitting knife and severed most of the creature’s head. Of course Harvey bought this specimen too, took it home in his wagon, and stored it in brine in his shed. Although this creature was smaller than the previous one, its tentacles measured up to twenty-four feet. Harvey presented his giant squid specimens and papers to Yale University professor A.E. Verril, an authority on cephalopods. Four years later, a severe windstorm drove another giant squid ashore at Catalina, and it was acquired by the New York Aquarium for $500. Still other encounters and specimens proliferated (Fitzgerald 2006, 49–71). As striking as these encounters are, it was the giant squid’s attack on a 150-ton schooner in 1874 that reportedly spilled—not squid “ink” but copious printing ink in newspapers throughout Canada and the United States. My source cited testimony of both many survivors and witnesses from a nearby ship, the Strathowen. Supposedly the schooner, the Peril, had been in Atlantic waters to the south of Newfoundland. Suddenly a gigantic creature rose from the sea and wrapped its tentacles around the Peril. Captain James Flood later told how he had grabbed up his rifle and—despite Newfoundlander Bill Darling’s warning not to shoot and so enrage the huge creature—did just that. “The oblong body,” he said, “was at least half the size of our vessel in length and just as thick. The train must have been a hundred feet long.” Although the men assailed the monstrosity with axes, it pulled the craft over and dragged it beneath the waves. The Strathowen moved in then and rescued the captain and his surviving crew members. Seeking to verify the story and to document the facts, I set Google on the trail and in time was led from waters south of Newfoundland across the Atlantic and around the tip of Africa to the Indian Ocean’s Bay of Bengal! From there, in June 1874 reportedly, accounts supposedly appeared in Indian newspapers about an attack on a 150-ton schooner—accounts whose text was nearly identical to the foregoing. In fact, the publishing trail soon led to The Times of London, where intrepid CFI Libraries Director Tim Binga was eventually able to secure a digital copy of the story, titled “A Successor to the Sea Serpent,” which appeared in The Times of July 4, 1874, on page 8. However, it had in turn been taken from the Homeward Mail, a British paper in India, and we soon had that text of Monday, June 29, 1874, in hand. But is this story true? I immediately found it very doubtful, but some others have accepted it. The authority on the giant squid, Richard Ellis (1998, 257–265), includes it in his list of 121 “Authenticated Giant Squid Sightings” (1545–1996); however, his source is at a century’s remove. Fitzgerald (2005, 74–76) insists of the attack on the schooner, “This attack was not imaginary”; and yet we have seen that he thought it occurred off the Newfoundland coast, and his source was also untrustworthy (Ellis 1998). No less a figure than Arthur C. Clarke wrote of The Times account, “If you think this an improbable story, I do not blame you; I would not take it very seriously myself, if it had appeared anywhere except in the shipping column of The Times—a paper not noted for sensational journalism” (Clarke 1974). However, as we have seen, it did first appear somewhere else, in a source lacking The Times’ reputation, Homeward Mail, which said it had in turn been “communicated to the Indian papers.” By whom is not stated, so the original remains unknown—three or so steps back from The Times. I feel sure that if Clarke had known all this he would not have given his endorsement—equivocal though it was. From what we know of the giant squid, such an attack as that alleged on a 150-ton schooner would not seem credible. The largest specimen known was only fifty-nine feet long and weighed just under a ton—being a female, which is typically larger than the male (“Giant Squid Facts” 2018). 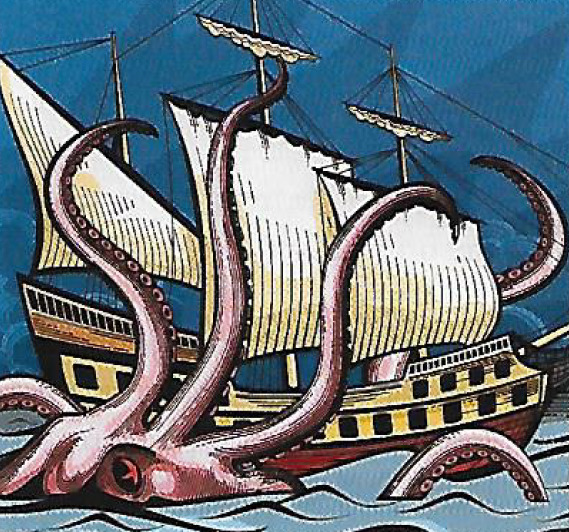 Regarding old sailors’ tales of giant squids overpowering ships or snatching someone from deck or shore, advises one source, “None of these turn out to be true” (“Giant Squid Found” 2007). That the writer is not only anonymous but avoids telling us whether he is a reporter or other communicant is suspicious, as is the introductory phrase that the story “has been communicated”—the passive-voice construction aiding in the concealment of the author. And of course the existence of “Captain James Floyd” likewise remains unverified and questionable. “Floyd” certainly seems to have missed his true calling—not as a ship’s captain but as a spinner of adventure yarns. He reproduces dialect, having one crewman state, “and it ain’t the sea sarpent, for he’s too round for that ere critter.” His attention to detail is admirable: he notes that three of the crew “had found axes, and one a rusty cutlass.” He describes “the advancing monster” as “a huge oblong mass moving by jerks just under the surface of the water.” Then, he says, “In the time I have taken to write this the brute struck us, and the ship quivered under the thud; in another moment, monstrous arms like trees seized the vessel and she heeled [tilted] over.” I suspect “Floyd” is the invention of the anonymous author. Squid have eight arms, which have suckers along their entire length, and a pair of longer tentacles, with suckers only at the tip. A list of squid sightings and strandings (Ellis 1998, 257–264) lists only two for the Indian Ocean: one the questionable Pearl story and one other, the following year, in the Southern Indian Ocean, of “unknown” size. Boyle, Richard. 1999. When the squid sank a schooner. The Sunday Times (December 12). Clarke, Arthur C. 1974. The Treasure of the Great Reef; quoted in Boyle 1999. Colossal Squid. 2018. Available online at https://en.wikipedia.org/wiki/Colossal_squid; accessed September 6, 2018. Dockett, Eric. 2017. Colossal Squid vs. Giant Squid: The Real Kraken Sea Monster. Available online at https://owlcation.com/stem/Colossal-Squid-vs-Giant-Squid-the-Real-Kraken-Sea-Monster; accessed September 6, 2018. Ellis, Richard. 1994. Monsters of the Sea. New York: Alfred A. Knopf. ———. 1998. The Search for the Giant Squid: The Biology and Mythology of the World’s Most Elusive Creature. New York: Penguin Books. Fitzgerald, Jack. 2005. Ghosts and Oddities. St. John’s, NL Canada: Jefferson Publishing. ———. 2006. Newfoundland Adventures. St. John’s, NL Canada: Creative Publishers. Giant Squid Facts. 2018. Available online at www.softschools.com/facts/animals/giant_squid_facts/113; accessed September 18, 2018. Giant Squid Found. 2007. Monster Quest, Season 1, Episode 3, originally aired November 14. Harvey, Rev. Moses. 1899. A Sea Monster Unmasked. Science Digest. Cited in Fitzgerald 2006. Leach, Maria, ed. 1984. Funk & Wagnalls Standard Dictionary of Folklore, Mythology, and Legend. New York: Harper & Row. Levy, Joel. 1999. A Natural History of the Unnatural World. New York: St. Martin’s Press. Nickell, Joe. 2009. Quest for the giant Eel. Skeptical Inquirer 33(4) (July/August). Smithsonian Ocean: Giant Squid. 2018. Available online at https://ocean.si.edu/ocean-life-/invertebrates/giant-squid; accessed September 18, 2018. Snow, Edward Rowe. 1948. Mysteries and Adventures Along the Atlantic Coast. Edition updated by Jeremy d’Entremont; Carlile MA: Commonwealth Editions, 2004, 133–134. A Successor to the Sea Serpent. 1874. The Times (London),(July 4):8. Verne, Jules. 1869. Twenty Thousand Leagues under the Sea. English translation, Project Gutenberg ebook, updated 2016, chapter XVIII: “The Poulps” (pp. 127–147). A Very Strange Story. 1874. Homeward Mail from India, China and the East (June 29).